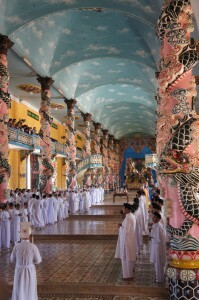 Vietnam has its own unique and interesting religion, Caodaism. It is a blend of eastern religions and philosophies like Buddhism and Confucianism with Christianity and a bit of sic-fi. Wikipedia has a very good description of the religion http://en.wikipedia.org/wiki/Caodaism. The fun highlights are: there are 72 planets with life, the better you behave the better planet you reincarnate to. There is a God and a mother Buddha. There are lots of saints including victor Hugo, Jesus, and Napoleon. Thomas Jefferson and Lenin, among others, are saints. Outside and inside the temple was like an explosion of color. 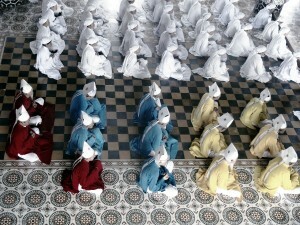 The worshipers all wore white except for the leaders. We arrived at the perfect time to see a prayer. 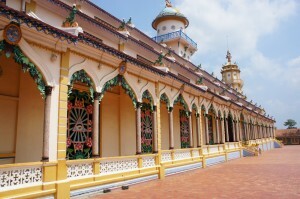 The Cao Dai Great Temple is located in Tay Ninh. 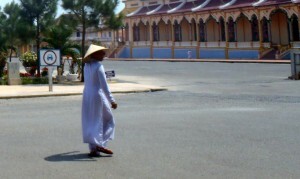 Tay Ninh is a short bus ride from Saigon and close to where the wartime picture of the name girl running from the American napalm strike was taken. While here, I read “The Girl From the Picture.” It is a story about Kim Phuc’s life before and after the bombing. During her childhood, she was a practicing Caodaist. The book mentioned the temple and talked about its significance in the war, which added another dimension to the visit for me. 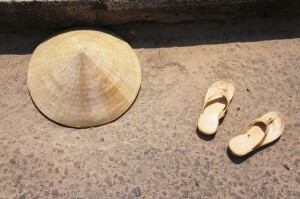 After the temple, we went to the Cu Chi tunnels. The tunnels were where the Viet Cong lived underground during the war. There were almost 200 km of tunnels. I went in one for about 2 minutes before I was done. It’s dark, damp, and stinky. Not somewhere I would want to be. After the trip, we stopped at an art factory. All the artwork was made by disabled and deformed people from the Vietnam war or aftermath. (e.g. 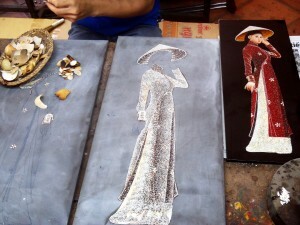 landmines and Agent Orange) Workers are basically on display making lacquered artwork made with mother of pearl and eggshells.